Three full-length thrillers in one ebook--get them all for a savings of more than fifty percent! 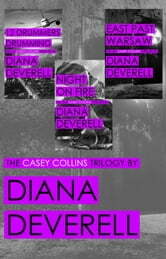 This trilogy features Casey Collins, a State Department specialist in the war on terror. Join Casey on a twisting ride through post-Cold War Europe as she's drawn off her desk job and into action not once--but three times. East Past Warsaw is “a tale that makes you pray it’s fiction.” (S.E. Warwick, mystery reviewer) En route to Berlin for an international conference, a crushing series of events force Casey into the field in pursuit of a rogue nuclear physicist with a supply of stolen plutonium bound for North Korea. A Macavity Award nominee acclaimed for her “sharp storytelling” (Publishers Weekly), Diana Deverell brings you an all-too-human heroine dealing with real-world problems. Buy the Casey Collins Trilogy today and begin an adventure with Casey that continues into the present in China Box, the fourth book in the series.